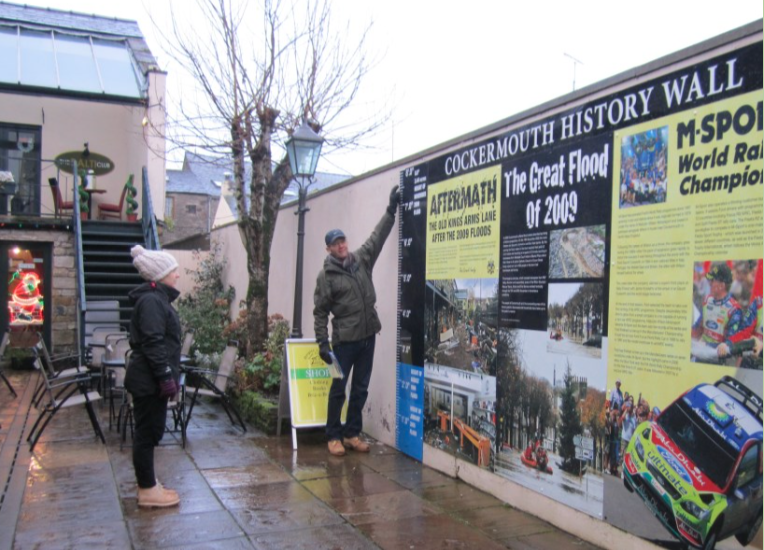 The Cockermouth History Wall - a new attraction in the village of Cockermouth depicting the history of the town in the wake of The Great Flood. “The capacity of social, economic, and environmental systems to cope with a hazardous event or trend or disturbance, responding or reorganizing in ways that maintain their essential function, identity, and structure, while also maintaining the capacity for adaptation, learning, and transformation” (IPCC, 2014). This definition closely links resilience with the capacity to adapt, where adaptive capacity refers to the aspect of resilience that reflects learning, flexibility to experiment and adopt novel solutions, and development of a generalized response to broad classes of challenges. This report* proposes that social learning can potentially be employed to help prompt this required change in order to build resilience. The report looks at different processes of Social Learning relevant to resilience building, mechanisms for triggering social learning for building resilience, challenges to building resilience (including social learning), methods for observing and measuring the effectiveness of soail learning and areas for further research on this topic. It builds on two emBRACE case studies: Floods in the North of England and Earthquakes in Turkey. *download the full text from right-hand column or via the links provided under further resources. Social learning has been defined in many ways but has evolved over time from being specifically about individual learning taking place in a social context, to be recognised as a critical aspect to achieve sustainability in the context of social-ecological change (Armitage 2005, Diduck 2010) ecological sustainability (Reed et al, 2010) climate change adaptation (Pelling et al, 2015, May and Plummer 2011, O`Brien and Keefe, 2013), and resilience (Pelling, 2011, Krasny et al. 2010) narratives and practice. This report adopts Reed et al’s (2010) well-crafted definition of social learning as learning that goes beyond the individual, to be embedded within social networks. These networks can be within a household, a friendship group, a village or town, an organisation or at a more regional or global community scale. However, it is important to note that collective learning is not the linear sum of individual learning. Therefore, a successful mass media campaign that achieved a societal change in understanding about resilience could not be considered social learning unless the message also spread from person to person through social networks (Reed et al, 2010). The idea behind the approach to social learning in the context of community resilience employed in this report is that through facilitated social learning, knowledge, values and action, competences can develop in harmony to increase a group’s capacity to build disaster resilience. Shared learning amongst peers is believed to facilitate faster and deeper learning compared to that received through the dissemination of an instructor only (Joiner, 1989; Elwyn et al., 2001). This results in the potential for informal communities of practice functioning as vehicles for peer learning, facilitating resilience building (Pelling, 2008). It is proposed that through social learning it is possible to move beyond knowledge transfer (which may well be out-dated or unsuitable for general use) towards learning that evolves with the input of various actors (including those at community level), is adaptable and is able to reflect on what is effective as it develops. If successful, this type of learning should lead to communities that have evolved to be flexible, adaptive and strong enough to bear future shocks. This should be what is taken by the term resilience. It should not be an end state or goal but a desirable process through which communities of practice become confident and competent at identifying, analysing, reflecting and adapting their own schema of understanding and practices for living in an uncertain world. What is the relevance of social learning to building resilience? A working heuristic framework is required in order to allow resilience to be framed in a pragmatic way that allows for the development of learning over time, but not at the expense of current needs or concerns. Figure 1 illustrates how community resilience is dependent upon learning (along with resources and capacities and appropriate effective actions), in maintaining essential functions in communities exposed to or affected by hazards. Figure 1 from page 3 of the report: The emBRACE framework of community resilience in the face of disaster impacts - how community resilience is dependent upon learning, along with resources and capacities and appropriate effective actions. This report demonstrates the utility of social learning in two case studies: on the north of England floods in Cumbria (see pages 18-21) and on earthquake resilience in Turkey (discussed from page 46). The most notable impact of social learning in these cases was its role in evolving resilience discourse and practice in order to mitigate the potential and manifest consequences of the disaster risks posed by environmental hazards. This facilitated adaptation to changes, understanding of the wider context, and enabled communities to 'bounce forwards' after disasters, rather than simply bouncing back.